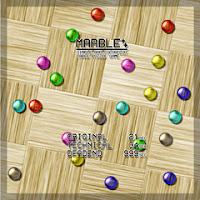 Marble is a recent addition to OMEGA's game listing page. The objective is to knock a marble towards another with the same color in order to make them disappear, until the entire board is cleared. There are several game modes available with a level editor to preset the number of objects before playing as well.